Tender and juicy Baked Chicken Breasts with a delicious honey mustard sauce takes only minutes to make! Baked Chicken Breasts couldn’t be any easier to prepare for a quick and easy dinner idea! 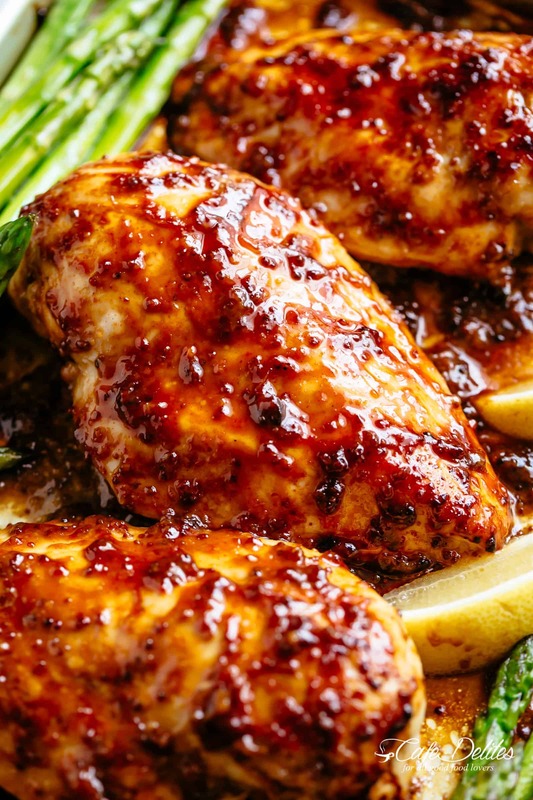 Smothered in a Honey Mustard Sauce with a kick of garlic and lemon juice, this will become your new favourite chicken breast recipe! Recipe includes optional roasted asparagus all cooked on the same pan! Complicated steps? Out the window with this one. 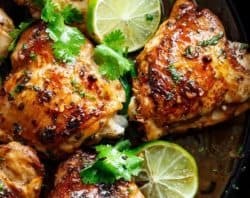 This recipe is just a throw-it-all-on-a-baking-sheet recipe and let the oven do it’s thing, using boneless, skinless chicken breasts. 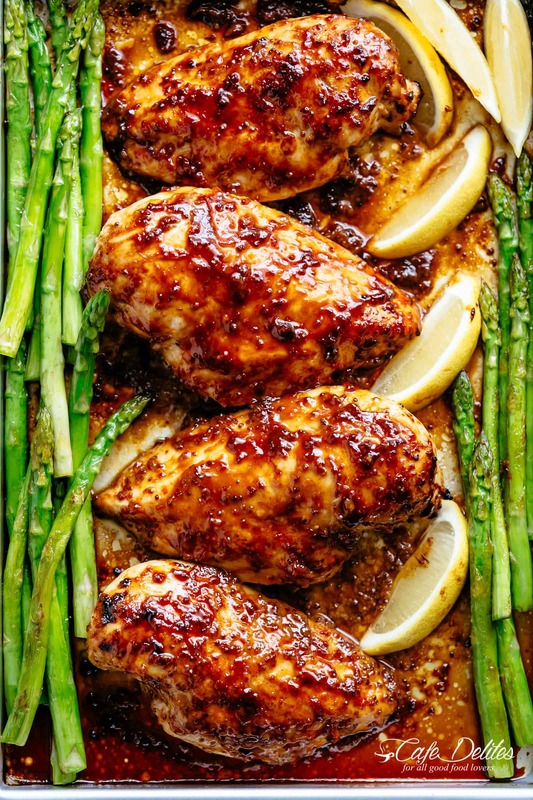 The acidity in the mustards help keep this chicken extra juicy and tender while baking, while the sauce provides a delicious even covering around each breast, sealing all of those crucial juices in! No dry chicken breast over here! HOW LONG DO YOU BAKE CHICKEN BREAST? 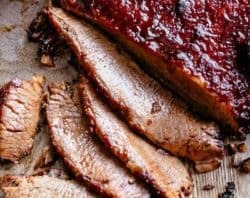 With this recipe, you are going to bake them first until they are just done (about 20-30 minutes, depending on the thickness of your breasts), then broil them for the last 3-4 minutes to get that beautiful, golden browned colour with crisp and caramelised edges! The best part about this recipe? No marinading time! PLUS no need to make a separate sauce to serve them with! While the chicken bakes, the juices in the pan mix together with the honey mustard sauce creating EXTRA sauce to serve them with! WHAT GOES WITH CHICKEN AS A SIDE DISH? You could also steam them separately, or roast them on a separate pan! Love Honey Mustard? Try these recipe! Tender and juicy Baked Chicken Breasts with a delicious honey mustard sauce takes only minutes to make! Baked Chicken couldn't be any easier to prepare for a quick and easy dinner idea! 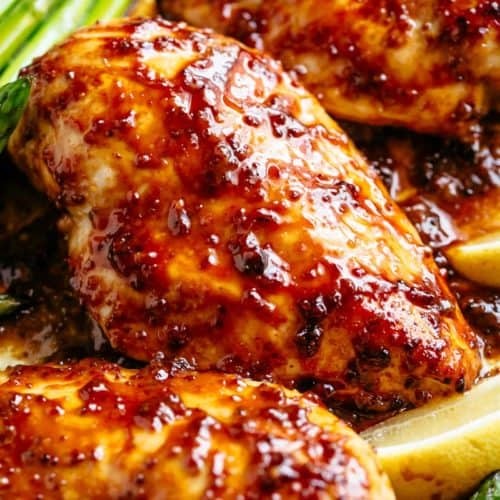 Smothered in a Honey Mustard Sauce with a kick of lemon juice, this will become your new favourite chicken breast recipe! Adapted from this Honey Mustard Salmon recipe! Preheat oven to 400°F | 200°C. Lightly grease a baking tray / sheet with oil and line with foil or parchment paper. Combine the oil, honey, mustards, garlic, lemon juice and paprika in a small bowl to combine well. Place the chicken onto the prepared baking sheet (tray). Season generously with salt and pepper. Spoon 3/4 of the honey mustard mixture evenly over the chicken and spread evenly all over each breast. Pour 1/4 cup water onto baking sheet to prevent burning, creating a sauce while baking. Bake until cooked through (about 20-30 minutes, depending on the thickness of your chicken breasts). 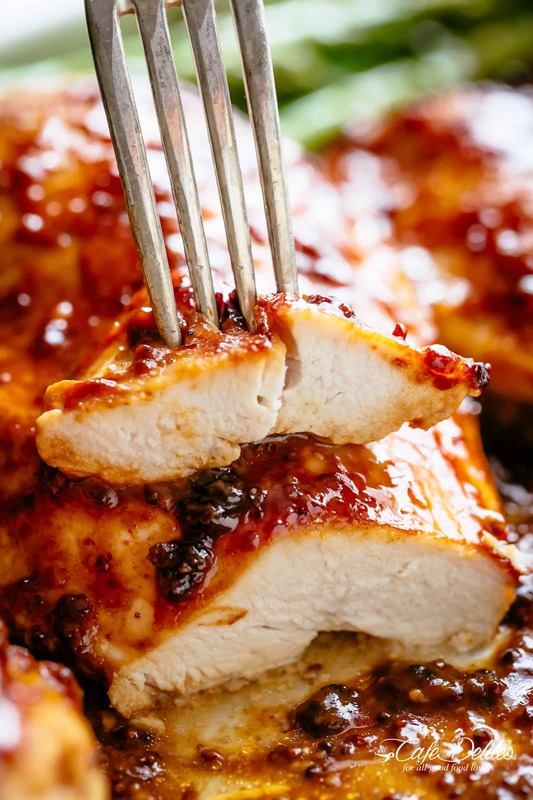 Spoon the remaining sauce over each breast and broil (or grill) for a further 3-4 minutes on medium-high heat to brown the chicken and caramelise the edges. Cover with foil and allow to rest for 10 minutes to allow the juices to settle before serving. Garnish with parsley and serve immediately with lemon wedges. To include roasted asparagus, arrange them onto the same baking sheet around the chicken in the last 10 minutes of cook time. Rotate them in the pan juices or pan sauce and season with salt and pepper. I tried this recipe tonight & it was so very good. I cut up carrots in 4ths and put them all around in the beginning cause they take longer to cook. The carrots & chicken was so tasty. So much better than eating out. Thanks for a great recipe! I think I’ll make this for Easter. I was looking for a good recipe to make tender, delicious chicken breasts then I found you recipe it looked mouth watering . I had all necessary ingredients in my store cupboard and I followed your recipe exactly the way you have shown, but I didn’t line the baking tray ,also I sliced some red and yellow peppers and laid them as a base underneath the chicken breasts .The dish turned out just like the one in your picture. It was juicy tender and very very tasty. The best chicken I have made my husband and the guests loved it. Thank you so much for sharing .This will go down as one of favourite dishes . 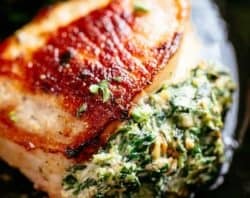 I was looking for a good receipe to make tender and delicious chicken breasts then I found your recipe and It looked mouthwatering. I had all necessary ingredients in my store cupboard and I followed your recipe exactly the way you have shown. but I didn’t line the baking tray ,also I sliced some red and yellow peppers and laid them as a base underneath the chicken breasts. The dish turned out just like the one in .your picture .It was juicy tender and and very tasty . The best I have made and my husband and the guests loved it .Thank you so much for sharing . This will go down as one of my my favourite recipes. This recipe was delicious exactly as written. It’s a keeper! Easy, tender, juicy (not dry) and yummy flavor…definitely a keeper for those nights when healthy and easy are a goal. I didn’t have coarse mustard on hand so just used plain Dijon. Made this evening. Now a family favourite. It’s a keeper! Your recipe helped me make the best chicken I have cooked in a while! My husband LOVED it. Thank you! I was in the grocery store the other day and wanted to make something different… and put “baked chicken breast” in google on my phone… This recipe came up. I made it today and it was delicious. I had it with roasted potatoes and salad. This recipe is a keeper. So easy and so good! I love it! 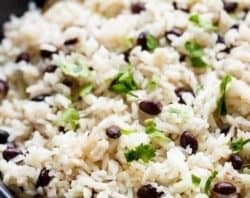 This recipe followed exactly as written was was tasty and delicious! I made it with a side of roasted potatoes but will definitely make rice next time because the sauce was plentiful and oh-so-tasty! Very good recipe. I made it tonight for my daughter home from college. We cooked asparagus the last ten minutes with the chicken per the recipe and loved it. Don’t forget the broiling at the end..this will be in the rotation going forward. Thank you. Another amazing recipe. My boyfriend loved the chicken’s after-taste! Great recipe, the sauce was delicious. Thank you for sharing. I am so glad to hear that you loved the recipe! The sauce really is great isn’t it?! Thanks for following along with me! Should I cover it in the first cooking? 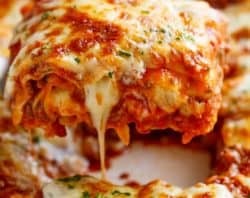 My daughter and I both have made this recipe. The sauce is really good. Could probably just put it on toast and it would be amazing lol. I added smoked jalapeno powder to mine. Is there a reason for greasing the pan a.n.d. using parchment? Usually, I’m a one or the other type of cook, but if there’s something I’m missing, I’m happy to give it a go. 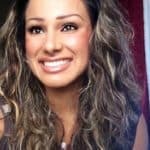 Thanks for all the amazing dinners, Karina – your blog is one of my go-tos! AW! Thank you so much! I prefer to do both so it is an easy release. It also depends on your cookware too. No recipe means no value to this page. 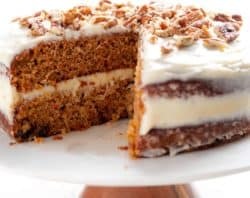 Planning on halving this recipe.. would I also need to half the amount of water added to baking sheet? Beautiful photos! Can’t wait to try this at home. 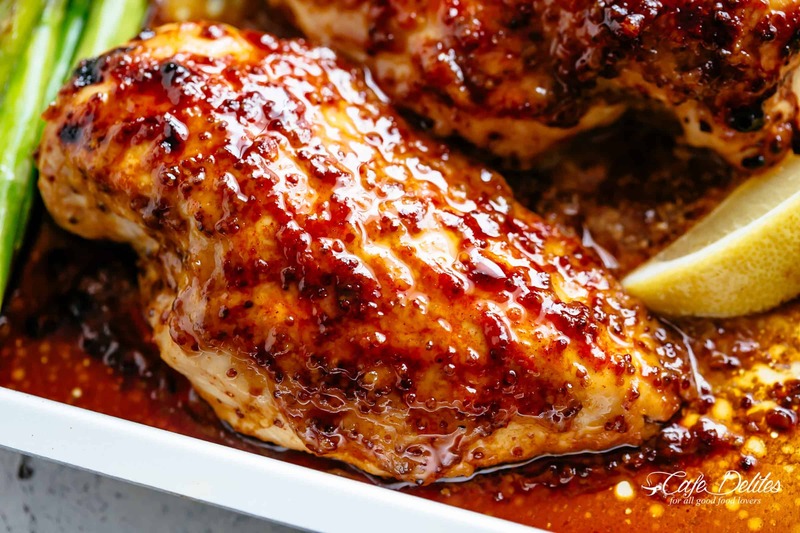 Thank you so much for sharing this honey mustard chicken recipe! Looks delicious! I love honey mustard sauces but I’m unable to have seeds anymore. Would this work with another mustard? Thank you. Yes, of course! I would try to match another mustard or even omitting it out of this recipe. Certain mustards may leave and/or change the taste drastically with other sauces. It is a great chicken recipe and you are welcome to alter it to your liking and lifestyle. Thanks so much for following along with me!